A HUMBLE request to put a return-and-earn bin for 10 cent cans in a Wagga wool store has grown into a much-appreciated boon for families like that of eight year-old girl Annie Singe. Annie is the daughter of Wagga district wool growers Cathryn and Jason Singe, and was born with a “Giant Congenital Melanocytic Nevus” or birthmark, which initially covered about one third of her torso. She has had about 50 operations in her lifetime to help remove the nevus and generate healthy skin, but these have not always been successful. 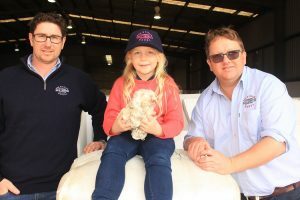 Last Thursday, wool brokers from across the nation donated 69 bales of wool that sold in a Melbourne charity auction for about $105,000 to support the Michael Manion Wool Industry Foundation. The foundation funded a trip by Annie and her mother Cathryn to the Nevus Outreach 2018 International Conference and Reunion in Chicago earlier this month. Annie addressed and thanked the brokers, buyers and exporters personally at the Brooklyn wool auction centre on her return from Chicago, where she and her mother met and exchanged their stories with fellow sufferers and carers. 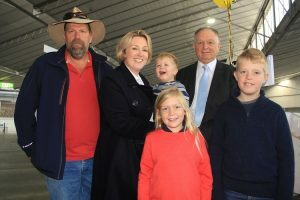 Michael Manion Wool Industry Foundation chairman Ken Stock said the wool sale funds would enable support to continue to support families like the Singe family. Cathryn Singe said the foundation support enabled Annie to seek treatment outside Australia and meet other children like her daughter, while husband looked after their two boys Samuel, 11, and Joseph, 3, at home. Jason and Cathryn Singe, left, holding Joseph, with MMWIF chairman Ken Stock, Annie Singe, and her other brother Samuel. Cathryn works off farm as a book keeper, and the family runs a Gum Hill blood Merino flock and self-replacing Santa Gertrudis-based composite beef herd on land at ‘Yeramba’ south-west of Henty in New South Wales and ‘Topside’ in the Tallangatta Valley near Barnwatha in Victoria. “We are very proud wool producers and very proud to be part of your industry. “So thank you very much and to Jeff and Daniel – I asked you guys to collect cans and I thought we were onto a winner – I’ve seen you both in action and the results the next day – thank you guys,” Cathryn said. Annie also thanked the crowded auction room of buyers and brokers. She said she had a great time at the conference, learnt a lot about her nevus, made some great friends, did a lot of swimming and summer camp activities. Despite many failed operations, Cathryn said reconstructive skin surgery has been able to reduce the size of the nevus-affected skin, which is sensitive, doesn’t have sweat glands and makes body heat regulation difficult. The family has worked hard to establish a network of fellow nevus sufferers for Annie and she extended that network in Chicago, but her treatment has meant many trips to Sydney. Cathryn said the family had always “sort of gone under the radar” with their fund-raising with a return-and-earn can operation among friends and family to pay for Annie’s medical and treatment travel costs since her first operation at 10 months-old. “This was a way of people helping us without actually going out of their way. “I rang Jeff and Daniel and said ‘Can you please put a bin in your shed’ I thought it’s an easy one – the Fox and Lillie boys – they all like a Friday night beer, over two years they might drink 500 cans, which is $50 and every $50 counts,” she said. As a long-time client of Jeff and Daniel, Jason said his family appreciated the help for Annie. “Loyalty goes both ways,” he said. FLR regional wool broking manager Jeff Angel said the Singe family are a great community-minded family. The Singes had wanted to get to the Chicago conference in two years’ time, but he and Daniel resolved to raise funds so they could go this year. “For us it was a good opportunity to help a family that time and time again has put their hand up to help others and never really asked for anything in return – they are the classic donaters,” he said. Elders show floor manager Mal Nicholls wore Michael Manion’s Richmond colours to sell the 69 bales with Michells buyer Len Tenace booking the sale. Mr Nicholls thanked the wool buyers for their ongoing benevolence and generosity. Mr Stock said the auction proceeds will help many families with different and difficult concerns and issues in the rural sector, and will help fund Annie’s trip to the Chicago conference next year. “As MMWIF administration costs are so negligible, unlike bigger charities, we feel this should be the charity of choice for the entire wool industry, be they growers, brokers or buyers — we are helping our own,” he said. The list of auction donors included Spearwood Wool Handlers (WA), Swan Wool Processors (WA), Barwon and Yarra Valley (VIC), Australian Merino Direct (VIC), Wool Solutions (TAS), New Zealand Merino (NZ), Elders Ltd (VIC), Quality Wool (SA), P.J.Morris (WA), Fletcher International Exports (NSW), B.N.Proud & Co (NSW), Ruralco Holdings (VIC), Australian Wool Network (VIC), Landmark (VIC), Grampians Wool (VIC), Sanders Wool (TAS), Riverina Wool (NSW), Ackroyd & Dadswell (VIC), A.R.Rhodes (SA), Aussie Wool Exports (SA), Hodge Wool (NSW), Karee Wool (VIC), Yarra wool (VIC), AWH Ltd (VIC), Techwool Trading (VIC), Landini Wool (VIC), Michell Direct (SA), Arcadian Wool Brokers (VIC), Dynon Wool (VIC), Roberts Wool (TAS), Fox and Lillie Rural (VIC).